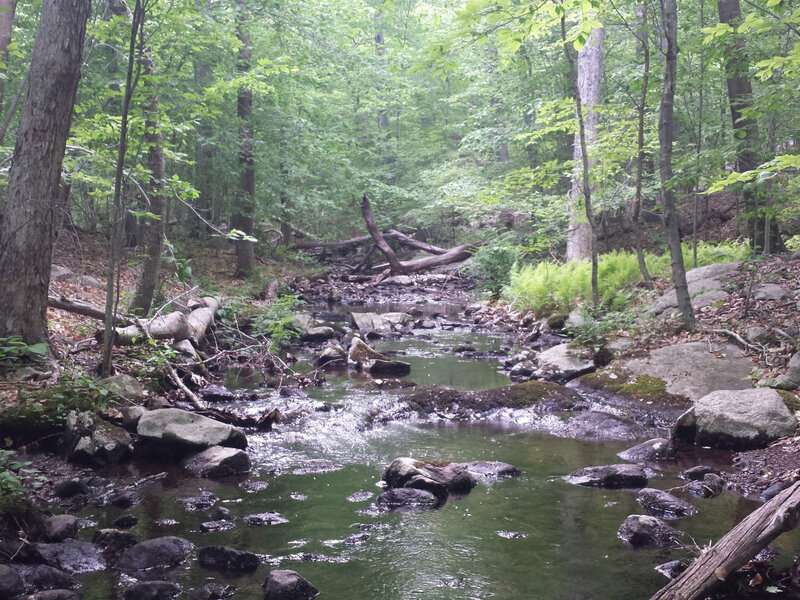 Babbling brooks, rocky hilltop clearings with views of NYC, and even a mini waterfall -- Norvin Green State Forest has a ton to offer those seeking a day trip escape into the wilderness. 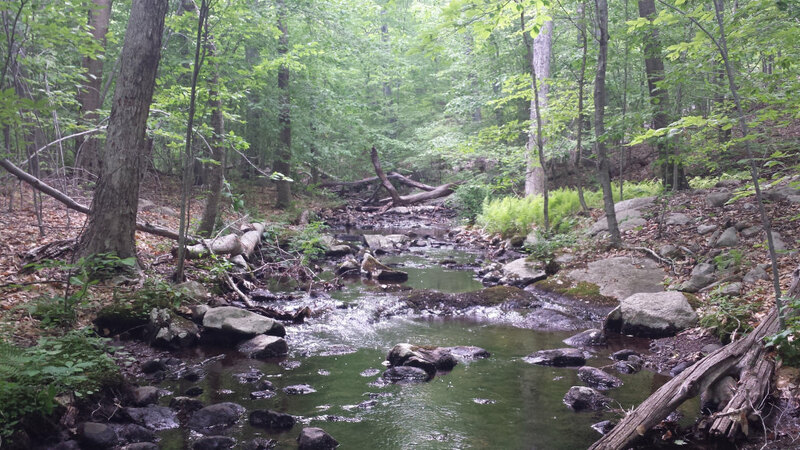 Babbling brooks, rocky hilltop clearings with views of NYC, and even a mini waterfall -- Norvin Green State Forest has a ton to offer those seeking a day trip escape into the wilderness. The winding road up through the Passaic County, New Jersey hills in this area is a fun drive, with several different mini turn-off lots for parking. The park itself is absolutely humungous, with tons of trail options of varying lengths and difficulty. A good suggestion prior to embarking on your Norvin Green adventure would be to review the map to plot your route prior to showing up since there are so many trail variations you can make. It'll also dictate the parking situation. One of the trademark features of any Norvin hike is that the forest floor is largely covered with boulders - small, medium, and large. The hikes here are virtually one big stone hop after another, which makes the hike a bit more challenging and intense, but also a lot more fun. There are lots of options for piecing together the trails. A good route recommendation that links you up with a few different trails would be to park and start at the Wyanokie Crest trail (Yellow) and follow that along to Otter Hole (Green), make a quick link up with Hewitt Butler (Blue), and then back onto Wyanokie Crest, to head back towards your car. One particular highlight of this route is located on the Wyanokie Crest trail, just before linking up with Otter Hole. There's a small clearing at one of the highest points of this trail, and if you stand on one of the giant boulders at this peak, on a clear day you can see the NYC skyline in all its glory. The views here are pretty spectacular and are a nice counterpoint to the rock hopping throughout the forest. Day trip hiking adventurers of all skill levels --be prepared to rock hop! The wildlife is also great, so bring a camera. The Norvin Green State forest is a state protected sanctuary for countless animals, including timber rattlesnakes and northern copperheads. So don't be alarmed when you roll up to the Wyanokie Crest trailhead and find the large sign warning of the snake population in the area. They won't bother you if you don't bother them. Small turn off parking lots are available along Glenwild Ave once you're off Rt. 287, or at the Weis Ecology Center on Snake Den Rd.